Sowing the Seeds is Faiths4Change schools and community programme. We deliver a range of land based services from workshops to year long on site growing with community and schools groups. Our services are chargeable although not for profit and we tailor all to meet the needs of those we will be working with through consultation and agreement. 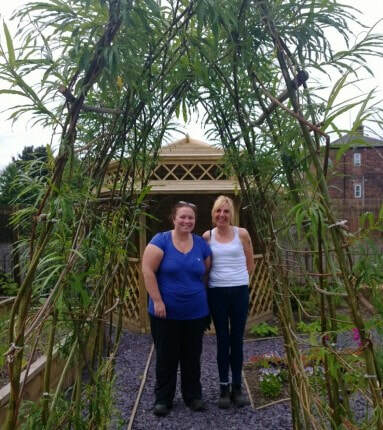 ​Lucy & Annie took the Faiths4Change Multi - Sensory Garden development workshop in a new direction recently following a call from L'Arche Liverpool. We re-imagined our workshop to include lots of outdoor play ideas, much more to touch and feel and taste. The core members and staff team got really involved taking a visual journey from their current garden space through a myriad of colours, tastes, textures and sounds from playing wooden musical instruments to tasting British apples. It was a pleasure to get to know the community as part of their journey to creating an outdoor space that really meets their needs they enjoyed it too! The TWW garden began through a series of workshops with women who use the Centre’s many facilities back in August 2013 and has steadily progressed through planning, building, planting and training to be a buzzing centre of activity and peaceful space for relaxation through the interventions of many women and external partners. Annie Merry, Faiths4Change, who project managed the creation of the garden and supported a range of partnerships to ensure maintenance and training revisited TWW in late June 2014 to see how the garden and women had grown together over the previous months and was overjoyed with what she heard and saw. “Having been out in the garden through the winter and spring, It’s lovely to watch the garden come alive, there is something new each week and we find ourselves looking for the changes, we have achieved so much and it’s great to see other women wandering around the garden and enjoying it.” - Sharon & Rose, two of our weekly participants. "Since doing the garden here I’ve become more motivated in general at home, I’ve been planting flowers with my kids even though I’ve never gardened before – I didn’t realise it was so easy.” - Sharon.